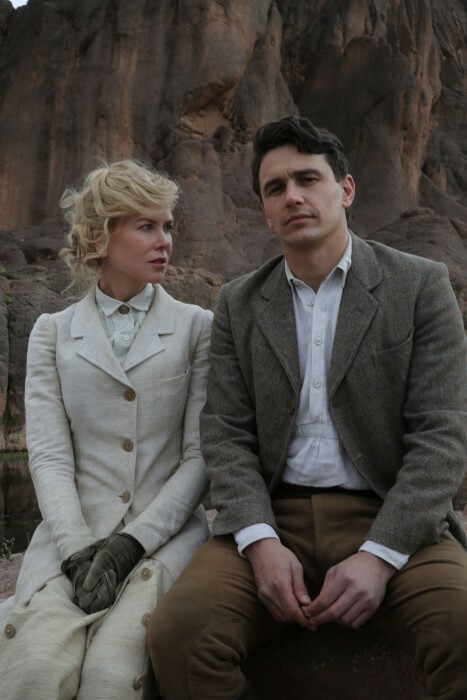 There are two romances at the heart of Werner Herzog’s 16th narrative feature, “The Queen of the Desert.” The first is that between Gertrude Lowthian Bell (Nicole Kidman), traveler-archeologist-political figure, and Henry Cadogan (James Franco), a British officer and civil servant who takes his name from a Conservative Member of Parliament who died in 1908 from cancer at the age of 40. The second is between Bell and Charles Doughty-Wylie (Damian Lewis), a Major in the British military based upon a namesake with whom Bell reportedly exchanged love letters in the two years prior to his death at Gallipoli in 1915. That both romances end prematurely isn’t in itself a problem, of course; it’s that in dramatic terms neither rises above the wishy-washy, making the rest of Herzog’s latest film a curiously run-of-the-mill affair, assisted through its motions by a wall-to-wall score that suggests it’s meant to be taken as a sincere prestige biopic rather than the breezy comedy it was received as by a forgiving or easygoing paying public at this year’s Berlin Film Festival. “The Queen of the Desert” opens in Cairo, 1921, at a meeting between top-ranking British military personnel, Winston Churchill (Christopher Fulford) among them. The order of the day is to divvy up the now fallen Ottoman Empire. There’s some initial disagreement among the men. “Petty rivalries only after cocktails,” quips Britain’s future Prime Minister, ever a figure of curt repartee. After further quibbles, he poses a question: who does know this politically diverse territory more than anyone? Cut to twelve years before this meeting, to the Lowthian Bell Estate, where our eponymous heroine-to-be dances at a ball with several intellectually inferior suitors, before proclaiming, in sobering daylight: “I can’t take it, I can’t take it anymore. I feel so domesticated.” Appealing to her rich father for an escape from the stifling doldrums of stiff upper lip England, Gertrude is sent to the British Embassy in Teheran, where she meets Cadogan, a man who teaches her Farsi and the poetry of Omar Kayyam. Asking her father back home permission to marry Cadogan, Gertrude finds her request rejected on the grounds that her chosen one is of too low a social station. It doesn’t end well. Working with DP Peter Zeitlinger, Herzog shoots early sequences with a palpable restlessness, as if from the perspective of an overawed young man, placing the Steadicam at around chest height and allowing Kidman to tower over us—and, but for Franco, most other characters too. In later scenes, though weather-beaten by the desert, Kidman retains her arrow-straight back and Rapunzel hair, an image of dignity and incorrigible independence among the long line of sheiks and tribal leaders she disarms with smiles, gifts and more than a smattering of chutzpah. Insisting she is merely an archaeologist to the foreigners she meets and merely a traveler to two British archaeologists—among whom is wily T. E. Lawrence (Robert Pattinson), a fellow eccentric with a PhD who foregoes gendered formalities by calling her Gertie—Gertrude is able to negotiate her way across the visually barren and politically labyrinthine Arab land with relative ease. There’s little in the way of narrative tension. Herzog, who has ridden unchecked on the coattails of his own reputation—as a visionary documentarian with a cool voice, a knack for bringing equally oddball individuals to the big screen, and an investment in things known or referred to as ecstatic truths—was presumably drawn to Bell because of her startling life arc: from the claustrophobic domestic prison of her class to a leading political influence on Arabian politics and the British government’s policies on same. But the paint-by-numbers feel of this biographical overview never threatens to dig deeper. What, at the end of all this, remains but for Bell’s own enigma? Kidman, for her part, does what she can—if that’s ever much at all—with the dreadful dialogue she’s given, looking pensively across the vast sands before her as a “Dear Diary” voiceover tells us that her heart belongs to no one but the desert. In contrast, scant time is given by Herzog and his collaborators to the political complexities of the fiercely tribal land that Bell helped divide in line with the imperialist agendas that went far beyond her. The veteran director seemingly has little interest in demystifying the small legend that precedes and follows the real-life person, preferring to speculate about her romantic life than the insidious foreign policies that both conditioned and were conditioned by her. That’s all well and good, of course, if the narrower focus finds enough actorly nuances to justify it. But as Gertie’s two leading men, Herzog casts a lazy jester in Franco and an overworked thesp in Lewis. Given the intrigues and even political insights that a serious, fully committed treatment of Bell’s life might have resulted in, it’s a shame her years in the land she loved are apparently reducible to ill-fated investments in two bland, charmless men.